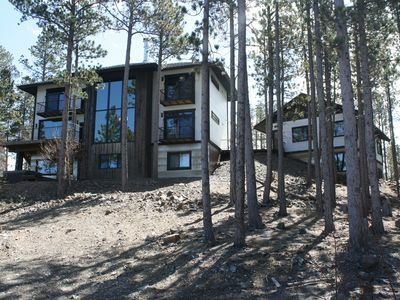 Brand New - 4 BR Modern Rustic Cabin Near Terry Peak w/ Hot Tub + Large Deck! Welcome to your next favorite home-away-from-home here at Ramblin' Rose. 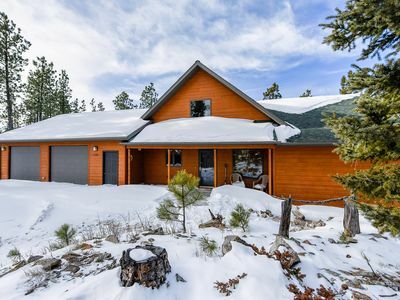 This beautifully decorated, custom, modern-rustic cabin is situated within the ponderosa pines in the Terry Peak subdivision. 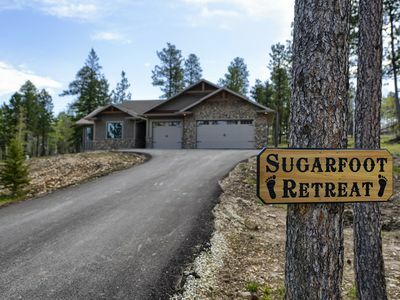 At just a couple blocks from Terry Peak, you’ll love the proximity to skiing/snowboarding while still having access to all the nearby trails in the heart of the Northern Black Hills recreational corridor. The Mickelson trail is only 5 minutes away, which connects to the larger trail system when riding your ATVs or snowmobiles. You can be in Deadwood gambling and enjoying the local saloons in less than 15 minutes. Or cruising through the rim-rock canyon walls of Spearfish Canyon in 10 minutes where you can stop and fish in the crystal clear waters or hike to unique rock formations. If you’re visiting to enjoy Mount Rushmore, Keystone, Hill City, and Custer, you can be enjoying all the wonderful sites within an hours drive. 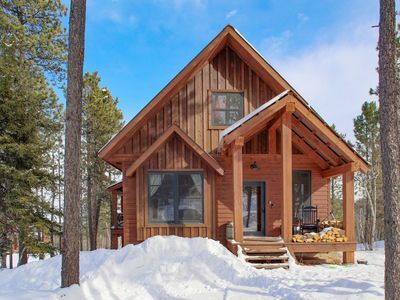 Having the ability to walk out your door and ATV, snowmobile, mountain bike, hike, fish, or ski, gives you the convenience you’ve been looking for when planning your trip. 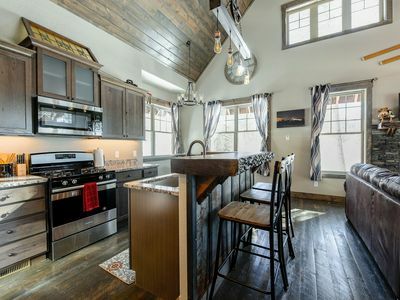 After visiting the local sites or riding the trails, you’ll be very happy to come home to enjoy the spacious accommodations here at Ramblin' Rose. 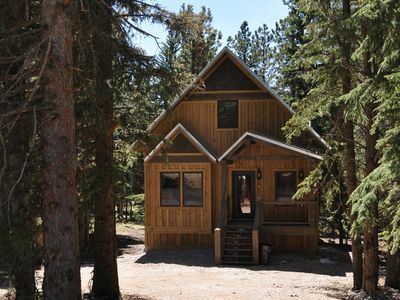 The cabin has been designed with simplicity and comfort in mind and with 4 total bedrooms to spread out in! 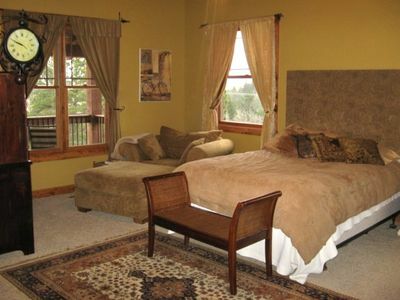 Thee bedroom upstairs includes a king bed and queen size sleeper sofa. 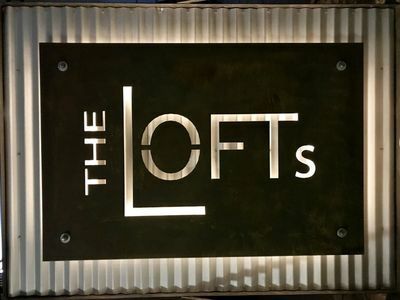 The upstairs bunk room has two single bunks and a sleeper ottoman, while the loft has a queen sleeper sofa and a double futon. The family room in the lower level has a queen sleeper sofa and a single sleeper sofa, there's also a bunk room on the lower level that has a double bunk, a single bunk, and a single trundle and the lower level bedroom includes a queen bed. The main floor is filled with large windows with views to the surrounding forest with an open kitchen leading into the main living area with a TV and fireplace. 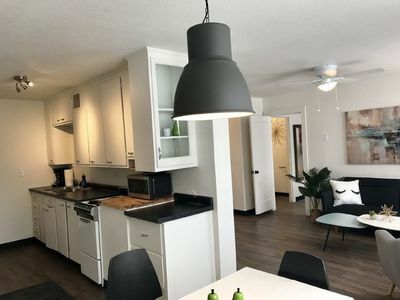 It’s the perfect place to create new memories with your friends/family with enough room for everyone. 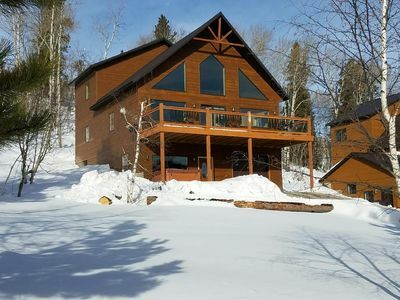 There’s a large wrap around deck with amazing views of the surrounding forest and some of the most beautifully star-lit night skies in the area. 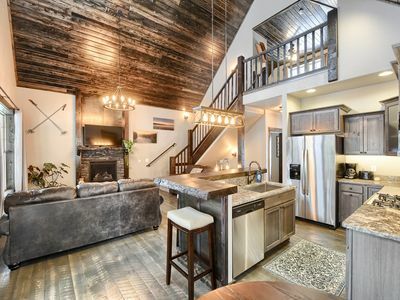 Upstairs you’ll find an open loft, bedroom, and another third story deck with great views! The lower level comes complete with a wet bar, cozy living area with a TV and large couch and 2 more bedrooms. It also opens up to a covered patio with a brand new hot tub! 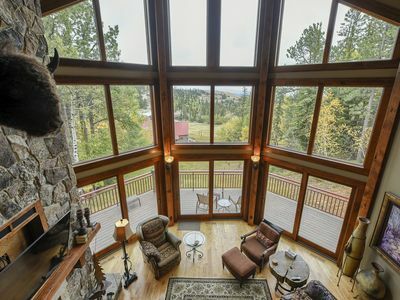 Make your next Black Hills vacation your favorite one yet. We welcome you to Ramblin' Rose and look forward to hosting you and your guests. 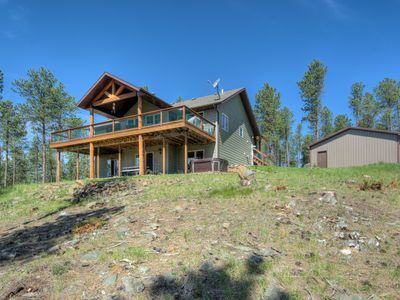 Family- Friendly Cabin With Large Deck, In The Heart Of The Black Hills! 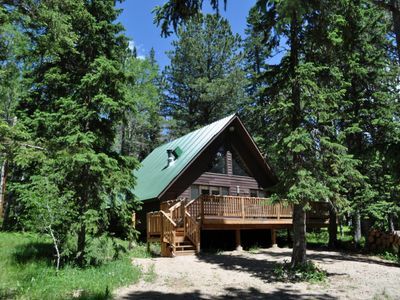 Whiskey Mountain - beautiful new cabin on Terry Peak Ski Area! 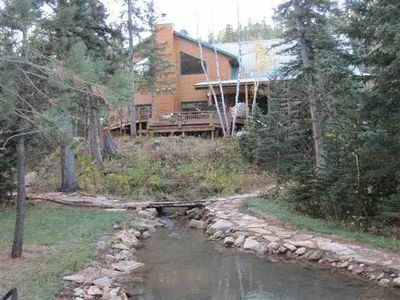 Luxury Spearfish Lodge in the Hills! 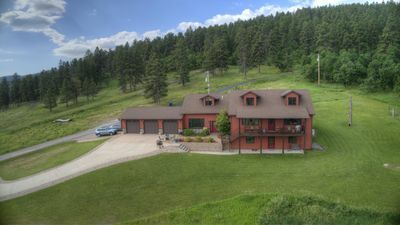 Spacious Property Near Deer Mountain and Snowmobile/ATV Trails! Alta Vista - Stunning new construction with beautiful views and private hot tub! 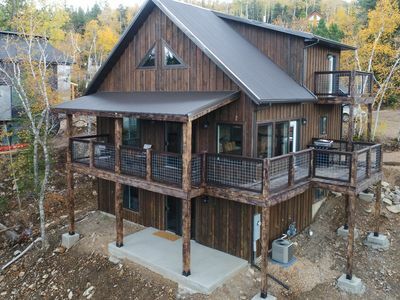 Brand New Build Near Terry Peak Ski Area finished in 2017! 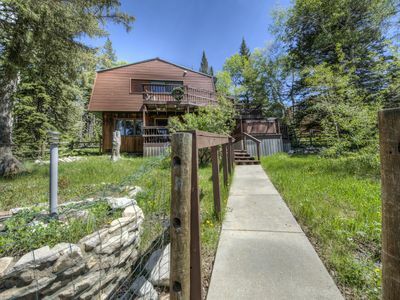 Cozy cabin in Terry Peak! 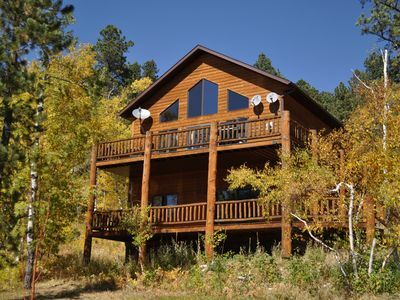 Cliffview Cabin is a dream come true for ATV riders! Spearfish Overlook! Convenience and view! 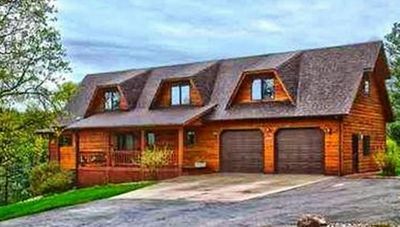 Timberland Lodge - Stunning New Family Cabin with beautiful scenery!